The Ibanez S771PB-NTF in Natural Flat is a solid body electric guitar. This fixed bridge model is part of the S Series. They are all about comfort and playability. The first thing you notice about this electric guitar is the stunning poplar burl top. 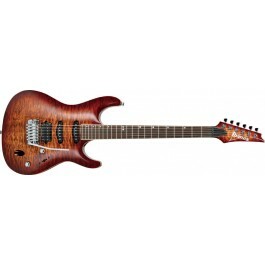 If you like fancy looking, unusual wood then you have to check out the Ibanez S771PB-NTF. The Natural finish displays some some attractive wood grains. This has been fitted to a mahogany body. The S Series body really is comfortable to sit with. It's camber, smooth edges and thin dimensions really do hug your body. Bolted to this is Wizard III 3 piece maple neck. This has been fitted with a rosewood fretboard. Offset inlays for position markers complete the look. With 400 mm radius the action can be dropped pretty low. You should be able do some wild string bends without suffering any choking. With slim neck dimensions the Ibanez S771PB is a bit of a speed machine. Often Ibanez Guitars have double locking tremolo systems. These are great but sometimes you don't need the hassle. The Ibanez S771PB-NTF in Natural has been fitted with a fixed bridge. This delivers great sustain. It also adds tuning stability. This electric guitar is much easier to get in tune also. The INF Pickups are versatile and work for pretty much any type of music. Especially with the inclusion of the single coil middle pickup. The hardware has been finished in Cosmo Black. The Ibanez S771PB-NTF not only looks great it plays fantastic too. The fixed bridge on this electric guitar makes it user friendly and delivers big sustain.